I have not used an Adobe product since 2012. Yes, dear reader, it’s true. While I’ve had the Adobe Creative Suite and Creative Cloud products installed and available to me, I have not felt compelled to use them over other offerings. In all likelihood, I have popped open Illustrator or Photoshop for an occasional edit during this timeframe, but my primary set of tools for use day-to-day is conspicuously lacking in any Adobe products. Full disclosure: as a UX Designer, I have never designed an interface with Photoshop. I was a Macromedia kid back in the day, and became an Adobe user when they acquired my old favorites Fireworks, Dreamweaver, and yes, Flash. While my colleagues toiled away in Photoshop to create their mockups, I was more than happy to pop open Fireworks to draw rounded rectangles that could be adjusted without redrawing the shape. Vector-based, multi-page documents were where it was at, and Photoshop’s state management system wasn’t doing it for me. Neither was its raster-centric engine, which was great for photos but decidedly less so for interfaces. When I discovered an app called DrawIt, I could see a new contender in the works. It had many of the same features as Fireworks, but rendered things much more cleanly, as it used the rendering engine native to OS X instead of a custom engine, as Adobe had developed. This was starkly apparent in text rendering, which would usually feel heavier or lighter than the original mock when it was being rendered by the web browser (or later, the mobile device). DrawIt appeared to use the same engine as WebKit, which meant your mockup would look amazingly close to the real thing. DrawIt soon evolved into Sketch, and the rest was history. Crucially, Sketch was built with mobile in mind, which made light work of exporting assets at multiple resolutions. Add to all of this Adobe’s decision to discontinue Fireworks, and the transition was a no-brainer. Sketch is a modern tool for modern needs. “Ahh, but what about photos?”, you may ask. It’s true, Photoshop is still hands-down the best tool for manipulating photos, but this is not a task I’m faced with regularly. 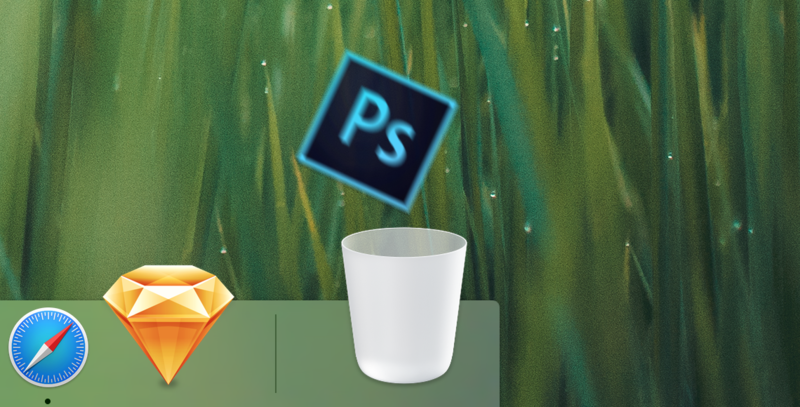 When I’ve needed to edit a photo or other raster image, I’ve found both Pixelmator and Affinity Photo to be entirely capable, and any stray PSDs that cross my path are usually handled by Affinity Designer with aplomb. Before Sketch, most of my colleagues who decided against Photoshop for UI work went with Illustrator, which as a vector-based tool provided some key advantages over Photoshop. For me, UI work in Illustrator always felt awkward, as layer effects were more limited than in other tools, the defaults were for print design, and snapping to a pixel grid arrived late in the game. Raster support was (and is) almost comically primitive, and added massive bloat to source files. No, this was a tool for vector illustrations, as the name suggests. To this day, it’s still the most capable tool for manipulating vector shapes. But drawing icons in Sketch is a much more enjoyable endeavor, as it lets me preview antialiasing as I draw the curve while zoomed in close, which is miles ahead of the click, release, guess-and-check method still used in Illustrator. For anything more advanced, a quick trip through Affinity Designer has proved it to be more than capable. While it has been many years since I’ve shipped any Flash content, it still had utility for me as a prototyping tool. As a non-developer, having a “do this when I click that” tool was a godsend for simple prototyping and user testing. Since then, I found myself swept up in a whirlwind of new prototyping tools, following Julie Zhuo name dropping QC for its role at Facebook. There is now a rich ecosystem of hi-fi prototyping tools that have expanded beyond simple click/response to allow swipes, drags, flicks and the resulting, often physics-based reactions. For my needs, I find that QC+Origami & jQC or Form most frequently fit the bill, with newcomer Principle also looking promising. UI design has evolved beyond static mocks, and it’s now easier to capture the poetry of an interaction than it ever was before. With the advent of mobile and with hi-fi prototyping tools now in abundance, Flash has never been less relevant. So, what’s wrong with Adobe? After all, this is the same pioneering company who 30 years ago brought Bézier curves to vector illustration. If anything, I believe Adobe has become a victim of its own success. As a tool like Photoshop has grown in popularity, so have the number of use cases it has grown to support. Photoshop can be used for both print and for UI work. So should it default to CMYK & inches, or should it default to RGB & pixels? As Adobe sees this as their one-size-fits-all solution, they have tried to remain neutral, instead letting the user decide the right options for them. This is a process that leads to increased complexity, as the user has to wade through a sea of “right options” for other use cases in order to find the right options for themselves, with a decreasing ratio of signal-to-noise over time. And it’s been 25 years. Adobe products are heavy. Photoshop is the ten pound Swiss Army knife you can use to hammer in a nail. Sketch is a hammer, with no knife blade and no need for one. Sketch has one audience — digital designers — and therefore only serves one master. It’s opinionated software, which leads to better, clearer solutions to the problems it sets out to solve. Adobe was once a team of groundbreakers who revolutionized graphics software. Today, they’re a mixed bag, delivering powerful but complicated software with aggressive update mechanisms. It’s a company that recently found itself both 3rd in their industry on Fortune’s list of World’s Most Admired Companies and 5th on a list of the internet’s Most Hated Companies. We love them, we hate them. More focused, opinionated software. Instead of adding more features to Photoshop to cater to digital designers, create a tool for digital designers. Design Space is a step in the right direction, but I don’t want to use a tool-within-a-tool any more than I did when my web browser came bundled with a mail client. Give us an uncrowded version of Photoshop for print and another (Design Space?) for screen. Same goes for Illustrator — I should never have to worry about color spaces or ems vs. picas when designing for mobile. Quieter software updates. Seriously. Give us silent updates or give us death. Better tools for prototyping. Edge Animate is a fine replacement for Flash, but it’s an animation tool at its core, not a prototyping tool. Show us something with smooth, 60FPS multitouch interaction on devices, an interactive desktop viewer, common design patterns for iOS/Android and click-and-drag simplicity. If you can integrate that with a suite of focused design tools and make it dirt-simple to share with a team, you might just have a winner on your hands. Adobe can still release a compelling offering that could win me back. Until that point, I’m happy to support the indie developers who are actually meeting the needs of the modern designer. If you’re a digital designer, I’d encourage you to vote with your wallet and do the same. Designers — healthcare needs you, stat! Hans van de Bruggen is a designer living in New York City. He has previously worked for LinkedIn and Atlassian. Currently, he runs design for Cureatr, a mobile healthcare startup. Design @ Netflix. A really hoopy frood.